The Back Yard Slide is perfect for adults and kids. The Back Yard Slide comes with a massiv eflat boucning area that is approx. 15'x17' big. BUT THATS JUST THE BEGINNING! There is a massive slide and stair way going up the unit all on the inside of the unit. 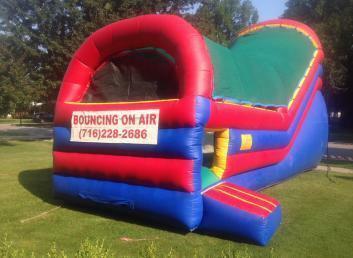 Looking for a diffrent inflatable that no one else has? This is it! BOOK TODAY!